It's Just 3 Days Before The Release Of #ThaCruiseTAPE: A Mixtape Concept Brought To You By "T'Sleek, HenshawBlaze & OFC". Over The Weeks You've Been Hit By 3 Splendid Songs Off It. 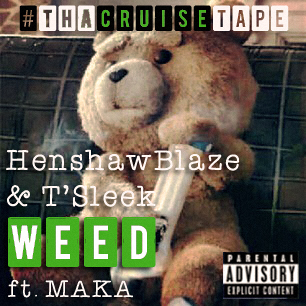 Well, Here's Another Rap-Rock Fusion Song Titled WEED By "T'Sleek & HenshawBlaze" Which They Featured A Very Wonderful Singer "MAKA" On, To Prepare You On The Countdown To "#ThaCruiseTAPE RELEASE". You'd Have To Take A Listen Before You Make A Wrong Guess!, ENJOY IT.